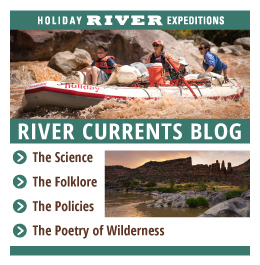 With river adventures offered along stretches of eight rivers in Colorado, Idaho and Utah, Holiday Expeditions can challenge the most experienced river runner capable of handling Class IV and Class V rapids or introduce the novice to Class I-III whitewater. On dry land, Holiday’s mountain bike trips follow undeveloped Jeep roads and double- track trails suitable for both the athletic beginner cyclist and the expert. This wide range of experiences enables Holiday to cater to rafters and cyclists ranging in age from 5 to 85. Ride the rugged Colorado River for five or six days as it cuts through the heart of southern Utah’s Canyonlands National Park and you’ll discover Pueblo ruins that those confined to cars and tour buses simply miss. This stretch of water is the most precipitous on the Colorado River and qualifies as an intermediate whitewater experience during low water flows with Class I, II, III and IV rapids, while high water generates Class V rapids suitable for experts. For four days you’ll drift through the heart of Dinosaur National Monument on the Green River while retracing the watery path that marked the start of John Wesley Powell’s exploration of the Colorado River system in 1869. You’ll ‘put in’ at the twin 800-foot-high “Gates of Lodore” and drift past many-hued cliffs of Precambrian bedrock. This trip’s Class I-III rapids require paddlers of intermediate skill or better. The last untamed river in the Colorado River Basin, the Yampa winds its way through Colorado’s northwestern corner before converging with the Green River in Dinosaur National Monument. Congress has refused to dam this river and Mother Nature can’t, as evidenced by a 1965 flash flood that erected a rock barrier across the river channel. Within 24 hours the river cut a chasm through the dam and created Warm Springs Rapid, one of the 10 biggest navigable drops in the country. Intermediates and experts can choose from 4- or 5-day trips to tackle this river’s Class I-IV rapids. John Wesley Powell summed up the character of this stretch of the Green River well when he described it as “a region of the wildest desolation”. The name stuck and today you can buck many of the same rapids his boats did, marvel at the same towering canyon walls and puzzle, as Powell and his colleagues must have, at ancient petroglyphs and artifacts of the Fremont Indian culture. To add even more mystique, Butch Cassidy and the Sundance Kid used to haunt Desolation’s remote canyons. One of the tamer sections of the Green, with Class I-III rapids, this 5-day trip is perfect for beginners and families. You’ll float past desert slickrock and Anasazi Indian ruins as you run 83 miles of river water born as snowmelt along the Continental Divide in southern Colorado. There’s plenty of time to dally in polished limestone pools that dot the river’s side canyons or hike to the canyon rim for a striking view of Monument Canyon. With no rapid larger than a Class III, this 3- or 4-day trip is perfect for novices and landscape artists. If the Colorado River’s greatest work of art is the Grand Canyon, Westwater Canyon comes in a close second. Canyon walls rise 1,200 feet from the river bottom. The cliffs close in, pinching the riverbed and producing a whitewater experience for rafters seeking the excitement of Class IV rapids. Two- and three-day trips are available. The Big Daddy of Idaho’s whitewater, this stream is nicknamed the ‘River of No Return’ and flows fast and cold through the heart of Idaho’s pine forests. Here you’ll find turn-of-the-century homesteads, mining claims slowly being reclaimed by the forests, hot springs to soak in at day’s end, and white, sandy beaches on which to spread your sleeping bag. Ninety-two river miles are amply sprinkled with more than 40 major rapids ranging from Class I-IV. Five- or six-day trips are possible. The Snake River majestically defines the border between Idaho and Oregon with its run through Hell’s Canyon, a 7,000-foot abyss. Sign up for this three- or five-day trip down one of the country’s National Wild and Scenic Rivers and you’ll be guided through 80 miles of bucking whitewater. Rapids range in size from Class I-IV. A journey down the Lower Salmon challenges intermediates when low water levels create Class I-III rapids, but the river demands an expert’s ability when high-water flows generate tumultuous Class V rapids. The natural history of Idaho’s deep, forested canyons is combined with American history on this trip as you float the route along which Chief Joseph led his Nez Perce tribe during their 1877 flight from the U.S. Army. Normally a three- or four-day trip, you can combine this float with one down the Main Salmon to create a 12-day wilderness experience. This four-day, 90-mile bike trip is one of the best ways to truly experience the grandeur of Canyonlands National Park. Away from the crowded ‘front country,’ Holiday’s guides take you past Mussleman Arch, Monument Basin, Turks Head, Candlestick Tower and White Crack, along with countless other geologic wonders created by nature through the millennia. This revered section of Canyonlands National Park features sheer cliffs and tumbling gorges that combine in places to create labyrinthine passageways that lend their name to this part of the park. For four days and 75 miles you’ll be alone in this wilderness with plenty of time to explore the dazzling rockscape and ponder Anasazi ruins and petroglyphs. Straddling the Utah-Colorado border just south of Wyoming, Dinosaur National Monument offers a mixture of southern Utah’s red-rock and sandstone canyons and Idaho’s lodgepole and ponderosa pine forests. During this two-day, 50-mile trip you’ll pedal through both landscapes and go to the very rim of the Yampa River Gorge. This four-day adventure kicks off with two days of cycling in the majestic ponderosa stands of the La Sal Mountains, just outside of Moab, America’s mountain-biking capital. 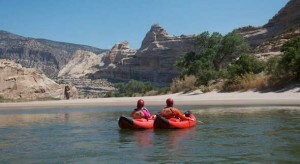 Two days rafting the whitewater that churns through Westwater Canyon wrap up your trip. You’ll cover 65 miles of trail through Canyonlands National Park during the first three days of this trek, winding your way through seemingly endless mesas before dropping into Cataract Canyon and gliding down onto its white sandstone benches. Here you’ll meet your rafts for the start of four days of bucking the rapids of the Colorado River. Few people have the opportunity to explore Dinosaur National Monument as thoroughly as those who sign on for this seven-day vacation. The first two days are spent cycling along a 46-mile corridor squeezed between the 1,200-foot-deep chasm of the Yampa River Gorge and Blue Mountain. On day three you leave your bike behind, swap your cycling shorts for a swimsuit and jump into a raft for five days on the Yampa River as it courses through fossil-filled Dinosaur National Monument. Whether you prefer a raft or a bicycle, or if you just can’t choose between the two, Holiday Expeditions has an adventure for everyone.